The Japanese Tea Garden menu has changed again; this time it has shrunk quite a bit from the bountiful menu previously available. No more sushi (except on weekends)! And no more tea and crackers/cookies combos that have been a staple for decades: strictly a la carte for that now, and much pricier, too. I've listed some specific menu items, along with the prices, to give you an idea of what's available and how much it costs. Naturally, this is subject to change. 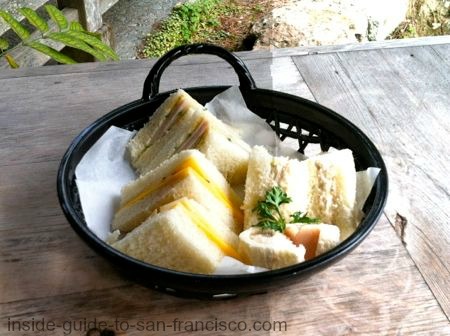 The Japanese Tea Sandwiches (which seem more like English tea sandwiches) are an assortment of turkey/cucumber, cheese/apple and tuna salad sandwiches, with the crusts cut off. I don't recommend it. 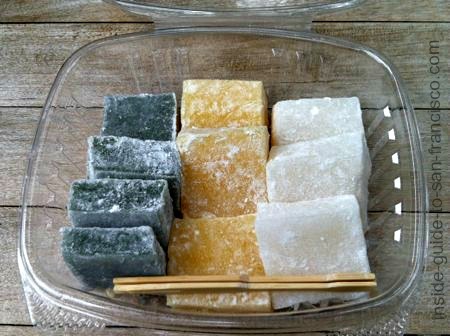 Kuzomochi, sweet rice cakes, an interesting sticky, gummy texture in different flavors (strawberry, mango, green tea, and lychee). May be an acquired taste. Arare is a dish of rice crackers, dried peas, peanuts, plus fortune cookies. $4.25 (small), $6.95 (large). Edamame, $4.25. Soy beans in pods. Dorayaki, $3.50. Japanese pancakes filled with red bean paste. There is a new dish available on weekends: a combination plate with Inari (rice inside fried tofu) and Futomaki (sushi rolls) for $12. Also added: Udon (noodle soup) for $9.50, Mini Nut Tarts (3) for $6.95 (looks good), and Petite Four, 3 pretty frosted cake bites for $6.95. Japanese Teas. 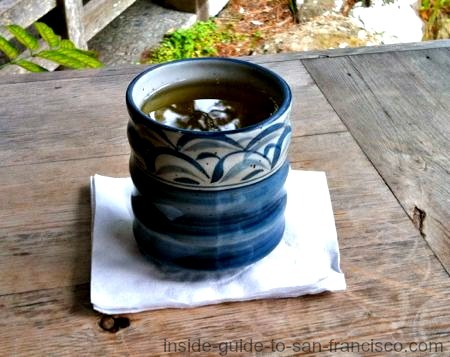 Choice of Sencha (green tea) $5.25, the rest, $3.95: Genmaicha (roasted green tea), Hojicha (another roasted green tea), jasmine tea, or iced green tea. 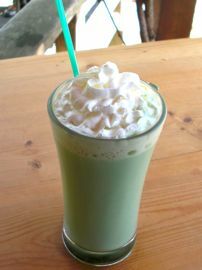 Special tea ceremony Matcha, (powdered green tea) $8.95. Also hot chocolate, coffee, Coke, Diet Coke, 7-Up, and bottled water. The tea and goodies combo used to be $4.50. Now it's a minimum $3.95 for tea and $4.25 for the cracker plate, $8.20 total, and $10.20 for tea and cookies. 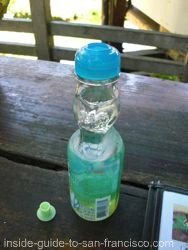 The Japanese Tea Garden menu also includes an interesting soft drink popular in Japan, but mostly unknown in the U.S.
Ramune: a carbonated, sweet drink in original, melon (yum! ), strawberry and orange flavors. The Ramune comes in an nifty glass bottle with a trick to opening it. There's a little glass marble at the top, which has to be pushed into the bottle. The marble sits in a little pocket in the bottle while you drink it (it can't escape). Kids would get a kick out of this odd arrangement. 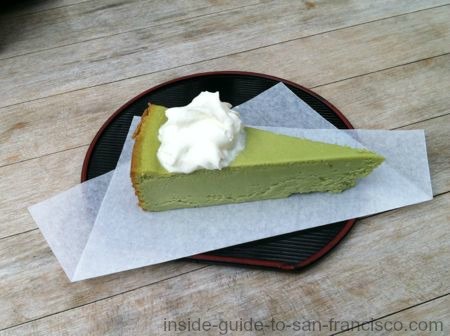 The Japanese Tea Garden menu items are available all day, during the hours the garden is open. They stop serving people 15 minutes before closing time. I hate to say this, because I love the tea garden, but you can get much better Japanese food elsewhere (see below for a suggestion). Nevertheless, the tea house is a great place to bask in serenity, and watch the birds and fish while sipping your hot tea; the atmosphere is so wonderful and the setting is unique. 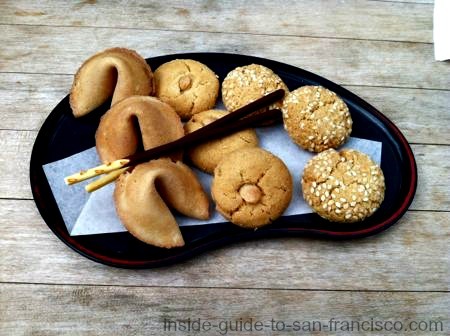 You can't go wrong with some tea, and rice crackers or cookies to go with it. 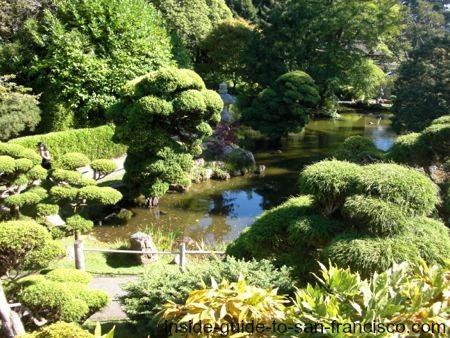 Information about the Japanese Tea Garden. 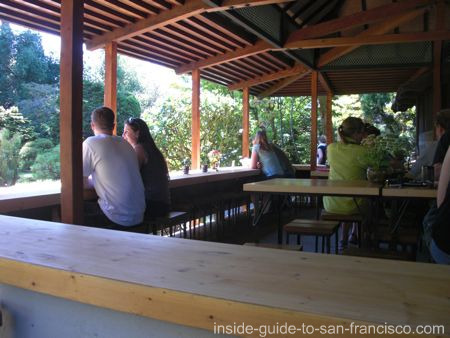 What to see in the Tea Garden, hours, maps, photos, how to get there. 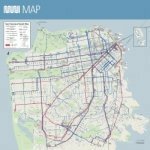 Looking for a good sushi restaurant nearby? You See Sushi is a (relatively) cheap and tasty sushi place near UCSF (and walking distance from the Tea Garden). Ready for a quick trip to Japan? 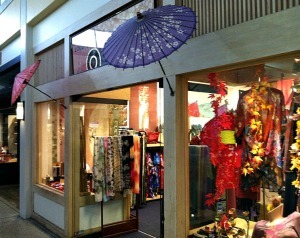 Shop for kimonos, manga and housewares, and stop for some ramen or teriyaki in San Francisco's Japantown.